Difference between revisions of "KPilot"
KPilot is a replacement for the Palm Desktop software from PalmSource Inc., which makes your PalmOS powered handheld (e.g., a Palm Zire 31) capable of exchanging information with your KDE powered computer. KPilot doesn't replace the Palm Desktop all by itself. 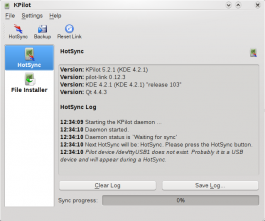 It connects and integrates a number of fine KDE 3.x applications such as Kontact into a package that can do everything the Palm Desktop can, and more. Online version of up-to-date KPilot User's Guide can be found here.